Thank you for your interest in one of Serra Toyota's online offerings. 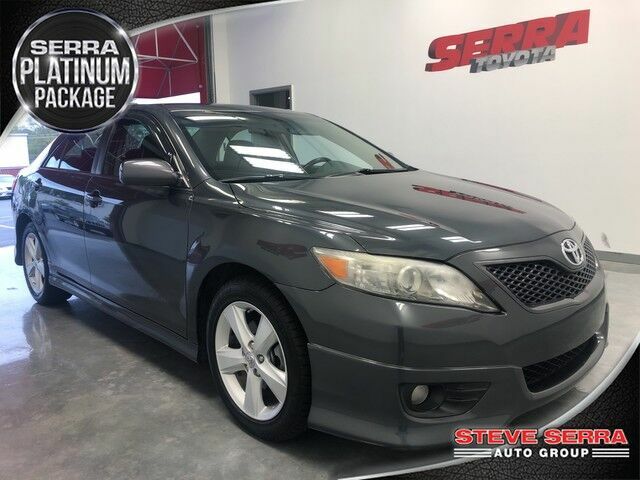 Please continue for more information regarding this 2010 Toyota Camry SE with 98,250mi. The greater your fuel-efficiency, the less your carbon footprint. And with exceptional MPGs, this Toyota Camry treads ever so lightly on Mother Earth. You can tell this 2010 Toyota Camry has been pampered by the fact that it has less than 98,250mi and appears with a showroom shine. This vehicle won't last long, take it home today. More information about the 2010 Toyota Camry: The 2010 Toyota Camry continues to live up to its reputation as one of the most sensible buys among midsize sedans, from the frugal-but-well-equipped 4-cylinder CE model to the V6 XLE that flirts with having luxury-car appointments. The Hybrid continues to be one of the most fuel efficient vehicles on the road, in addition to ranking as one of the lowest carbon dioxide offenders in its segment. Interesting features of this model are Value, available fuel economy and performance, luxury-car amenities, roomy interior, and smooth, quiet ride.